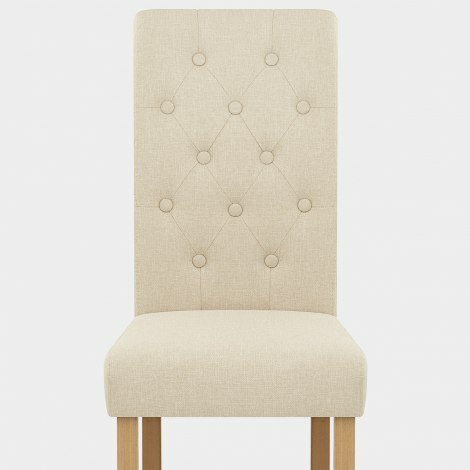 A classic addition to the dining room, the Portland Dining Chair Cream Fabric is a picture-perfect piece of furniture. Designed with durable materials and a traditional appearance, the Portland gives its surroundings a stylish sense of refinement. 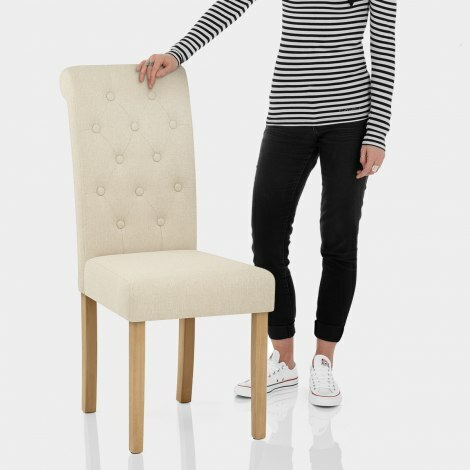 Covered in chic cream fabric, the comfortable padded seat is also super supportive due to the tall backrest. This also has a stylish scroll top design and includes button detail for a touch of class. The seat is set on a frame of four solid wooden legs, each featuring a polished oak finish that complements many spaces. Plus, your floor will remain in good condition with the protective pads that sit beneath each leg. "10 out of 10 would recommend to anyone"
Arrived next day, very well packed, very easy to put together, and they look so smart and more expensive than the actual price. 10 out of 10 would recommend to anyone.